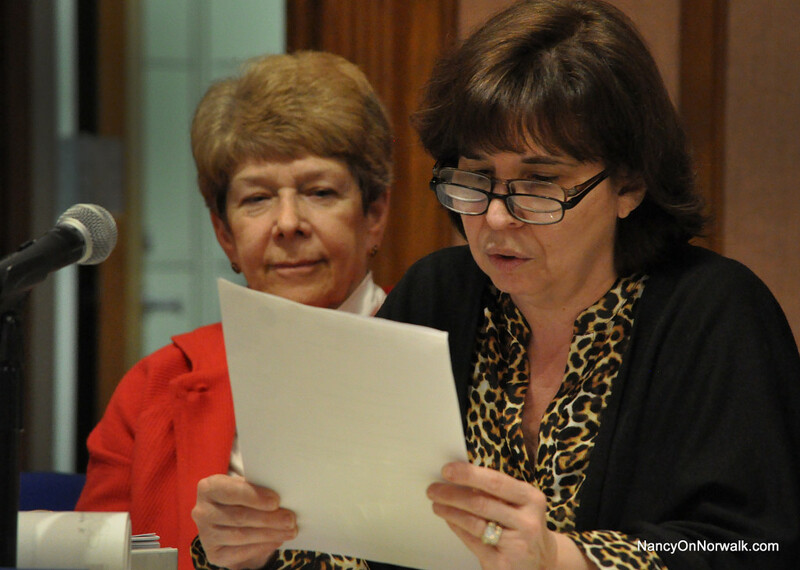 Norwalk Zoning Commissioners Jill Jacobson, left, and Linda Kruk. The Friends of Ryan Park (FoRP) have been rebuffed in its other legal action related to the Washington Village project. Stamford Superior Court Judge Edward Karazin on June 7 dismissed FoRP’s request for an injunction to “protect” Ryan Park from the nasty developers FoRP – or at least the two people claiming to be FoRP – is certain are going to put a path of dry egress through the park. “The plaintiff has not asked the court to settle a present controversy, but rather to avoid a future one. Until the plaintiff s alleged injury shifts from hypothetical to reasonably likely, the court lacks jurisdiction to hear the plaintiff s claims,” Karazin wrote in his decision. FoRP – seemingly just President Ganga Duleep and Treasurer Christopher Potts – has been contending that the city has a plan for “dry egress” that would bisect Ryan Park. The city argued that the dry egress “plan” that was presented in the application to the Connecticut Department of Environmental Protection (DEEP) is not a “plan” that has been presented to or approved by the Common Council, the Council Recreation and Parks Committee or the Mayor’s Advisory Committee on Ryan Park. FoRP argued that “no other route of dry egress avoiding Ryan Park has been proposed” and that there is a “substantial likelihood” that the dry egress would go through the park and result in trees being cut down in violation of the Connecticut Environmental Protection Act (CEPA). That’s even with “viewing the pleadings in the light most favorable” to FoRP, a legal necessity, Karazin wrote. Duleep and Potts attended – and walked out of – the recent meeting of the Mayor’s Advisory Committee on Ryan Park, where two designs for the park were unveiled after about a year’s work by an independent consultant, according to the meeting’s minutes. Duleep, Norwalk Recreation and Parks Department Director Mike Mocciae and Committee Chairman David Westmoreland were the only three committee members present, according to the minutes. A year ago, members included South Norwalk activists Ernie Dumas and Darlene Young, Washington Village Tenants Association President Raymond Dunlap and District B Common Council members Travis Simms and Faye Bowman. Also present at the June 1 meeting was Anna Duleep, as well as Gary Sorge of Stantec, the firm chosen to design a new park. Both designs seek to retain the park’s basketball court, although one has the court’s position rotated 90 degrees, and to have a gathering space or play space in the area of the amphitheater. At that point, Potts and both Duleeps left, the minutes state. 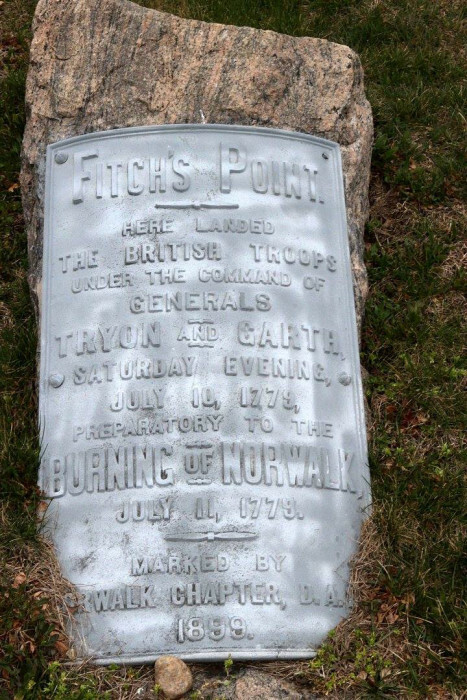 Is ‘Fitch’s Point’ public property? A map has turned up that appears to show that an East Norwalk Revolutionary War monument that is now inaccessible to the public is on public property, which is not what Common Council members have been saying. A map of Seaside Place appears to show that a Revolutionary War monument there is on public property. The monument, erected by the Daughters of the Revolutionary War (DAR) in 1899, proclaims that the British had landed there to begin the burning of Norwalk during the Revolutionary War. This is on Seaside Place, a private waterfront road, which the monument declares is Fitch’s Point. On April 14, 2015, the Council voted unanimously to un-name that Seaside Place, and give the name to a private driveway that is on the other side of the waterfront houses. Although pedestrians have been allowed on the private waterfront road as far back as anyone can remember, it’s now fenced off as a result. This came to the Council’s attention through Council member Rich Bonenfant (R-At Large), who said he had reservations a year ago but voted with his caucus. “According to the map from the appraisal the Revolutionary War Monument is not on ‘Private Property’ nor do the lots along Seaside Place on this map extend to the water. The property lines border up to the road except for 9A and 10A according to the map. The property lines are marked very clear with the measurements of each of the lots. According to this map the statement that Bonenfant said he heard from other council members, ‘It’s private property they can do what they want’, are false. The properties do not extend over the road to the sea wall therefore it’s not private to them and there should be access to the monument. “I never imagined doing this, I was asked to do it,” Zoning Commissioner Linda Kruk said at the June 9 Zoning Committee meeting, making a farewell speech that paid homage to the Commission but also chided some of the actions that have been taken. The terms of Kruk, Emily Wilson and Jill Jacobson expire on July 1. Mayor Harry Rilling has declined to comment on who he might appoint, but it was clear on June 9 that Kruk was certain it wouldn’t be her. Three years ago, Kruk sought the Republican Party’s nomination for a Board of Education candidacy, but fell short. Then-Mayor Richard Moccia then appointed her to Zoning. It’s been an honor and an eye-opening experience, she said to her fellow Commissioners, but she objected to certain things, like the vote last month to require Odd Properties to put a sidewalk in front of its Day Street property as part of its renovation of a building there to create a contractor’s yard. Kruk and Jacobson voted against requiring the sidewalk work. “Sorry, but I have to equate it to extortion, a bit, because to hold somebody accountable for putting in something that the city didn’t take the time to do itself, then to say, ‘Well, we’ll give you that special permit but we’re going to make sure that you are going to take care of all of our problems in that spot.’ I think that’s wrong, period, I just don’t like it,” Kruk said in her last committee meeting, on June 9. “To a guy who just bought a building and he is just trying to make ends meet and get by, and margins for landscapers are not huge, I think we need to be a little more mindful of when we demand that someone to do that,” Kruk said, suggesting that maybe developers who make such improvements be given a break on their property taxes in their first year as a gesture of good will. “Regulations are not applied equally to certain people; they are sticking it to some people and not to others. Just because he happens to buy a building that doesn’t have sidewalks shouldn’t be his problem. It bothered me, and I felt like I needed to say it. It’s just wrong,” Kruk said. Kruk said she enjoyed serving on Zoning very much. Republican Town Committee Chairman Andy Conroy said Thursday that Kruk has not inquired about serving the city in any capacity. Often, the Zoning Commission will continue a public hearing for another month, if it’s gone long. Not so Wednesday. The hearing on AMEC Carting’s proposal went 4½ hours. Commission Chairman Adam Blank acknowledged there were quorum issues. In addition to the likely departures of Kruk and Jacobson, Commissioners Michael Witherspoon and Nate Sumpter had recused themselves from the AMEC decision. That left the five Commissioners present, plus Rod Johnson and an alternate who has not attended any Commission meetings. Johnson could have listened to the meeting via Zoning’s recording to vote next month, Blank said. Therefore, they all stayed – and the owner of Knipschildt Chocolatiers stayed, too. The public hearing on Knipschildt Chocolatiers’ proposed new Wall Street location began at about 11:30 p.m. and lasted just over a minute. Then the Commission voted to approve it. That’s how it works in Zoning – all the public hearings are held and then the Commission votes on everything at once. Fritz Knipschildt said he didn’t mind. The AMEC hearing was interesting, he said. You may be aware that the city pays Norwalk Police for their extra duty details even if the contractors they are working for do not pay the city. If not, read this story. AMEC Carting is on the list of companies that owe the city for police work, and on May 16 Norwalk Comptroller Frederic Gilden said the company had been cut off from further work until the bill was paid. At that time AMEC owed Norwalk $45,132.10. As of Tuesday, AMEC owed $20,399.49. Flying under the radar screen has been a Zoning Commission discussion about medical marijuana. Not that they have said much. At the May 12 Zoning Committee meeting, Acting Planning and Zoning Director Mike Wrinn said he was trying to get a possible moratorium on the growing of medical marijuana in Norwalk to a public hearing. Blank said a moratorium could not be indefinite, and Wrinn said he was looking for nine months. That could be renewed if the Commission was making progress on discussing issues such as how close marijuana could be grown to a church or a school and what kind of security would be needed. Wrinn got his hearing Wednesday, but the Commission tabled it at, again, at about 11:30 p.m. Blank commented that it wasn’t a good time for an hour-long discussion. At the May 12 Committee meeting, Wilson stumbled when she attempted to introduce the item, skipping it and saying she had been reading an old agenda. “What are you smoking?” Blank asked. NancyOnNorwalk called former Zoning Commission Chairman Joe Santo to get his response to comments made by former Zoning Commissioner Mike Mushak, about the history of Zoning. This is a reference to an incident some call the Mike Mushak Flower Pot Incident. A Zoning complaint was filed against Mushak two years ago, but Deputy Zoning Inspector Vladimir Mariano said at the time that the problem was that a flower pot had been removed from the front setback. The pot is necessary to signify that a stone area is not for the parking of vehicles, and that brings the property into compliance, he said. It’s been a tough week nationally and U.S. Rep. Jim Himes (D-Greenwich) would like to express some opinions. The zoning commission’s “mission should be to help everyone who comes before this Commission to be successful” — well, that includes homeowners, right? It seems they tend to help developers quite a lot, but homeowners not so much. Well, at least property developers aren’t the only ones Norwalk gives land away to. There are a few on Seaside Place whose home values have been improved by the know-nothing Council’s decision to grant their request to privatize public property. The map does not “prove” any such thing, nor did the council change ownership of anything. We swapped the name of a street to an unnamed street and made that previously named street unnamed. Both of those streets had been private before. A homeowner may or may not own to the center of the street on any street in Norwalk, depending on how deeds were being done at the time. Private streets are common property of the association, likely, and not individual home owners. Does anyone have a deed showing that Seaside Avenue a/k/a Seaside Place is owned by some legal entity other than the heirs of J. Clarence Hawkins? If so, I’d love to see this. 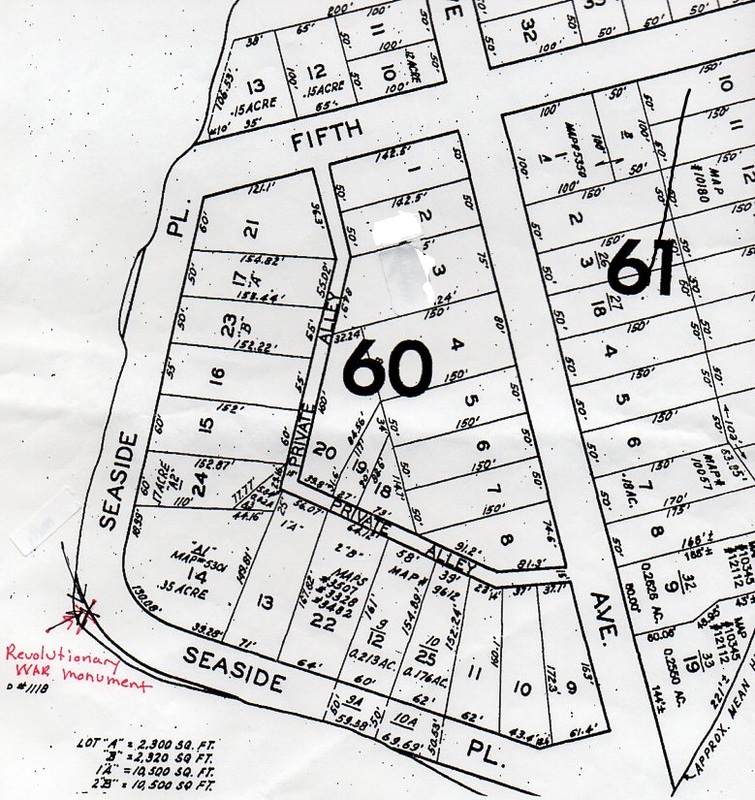 I have searched the deeds along this avenue, both present and past, and I see only that the avenue is not part of deeded land, that it is used in all cases to define a property boundary, and that private property owners on Seaside have a right of way over it. They also have right of way over the sea wall beyond the avenue, also known as riparian rights, but they don’t own that property either. I haven’t taken a measuring tape, but it looks to me as if the Revolutionary monument is on Avenue land. By the way, I feel somewhat privileged in that I have been personally invited to walk the avenue at will by several of the owners that live there, and I do so regularly. Others in the neighborhood used to do the same, but do not since the gates were erected, which seems a shame. The gates are intimidating, and I wish those who placed them could be convinced to reconsider. For those who may be interested, the name “Seaside Place” was originally coined as the name of a residential community, whereas now and for some time people have been using the name to refer to what is properly called “Seaside Avenue”. That’s confusing. The community was designed by J. C. Hawkins in 1890, shortly after he acquired what used to be the Fitch Farm. Map 84 is the principal artifact of this re-designation. Seaside Place consists of the entire area south of what is now Fifth Street. I think Seaside Avenue (Seaside Place if you insist, but I’m talking about the road) is a puzzle. It’s not public in the sense that the City means public. That makes it private (and Hawkins in the deeds he wrote also called it private), but without a legal owner, what kind of private does that compute to? I think no one has the right to tell anyone not to use it. I’m not a lawyer, but that’s what I think.